Not the battery i was thinking of. Is it too green overall? That's pretty much what it looked like to me. Early morning, heavily overcast, and yes, green. Only thing in the picture that wasn't green was the cabin. 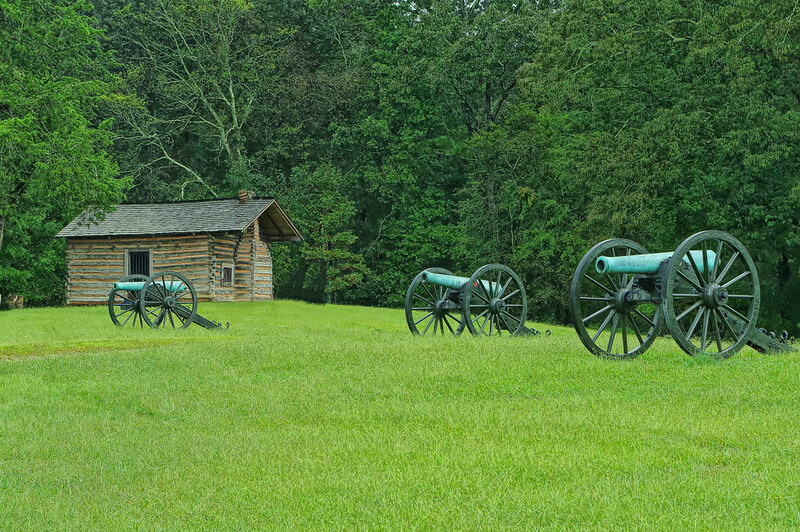 The trees, the grass, the barrels of the guns, and the carriages of the guns were all green. If you blow up the image, you can see the logs and mud chinking in the cabin have no green cast. 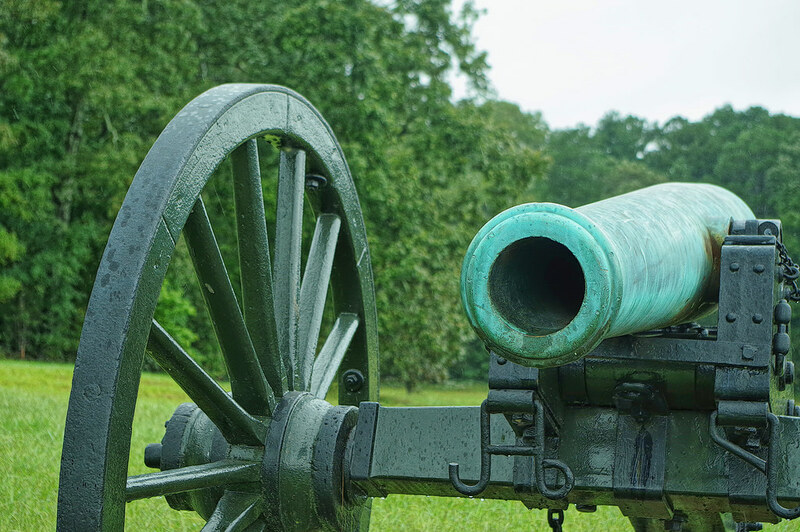 The cannons, I take it, are brass, bronze, or some other copper alloy rather than iron or steel, hence the blue-green copper oxide hue. My guess is that this is the cannon at image right in the original photo. I had supposed that the green on the wheels and the carriage was from an overgrowth of moss or algae, but the closeup reveals that these parts were actually painted that color. The paint appears to be fairly new, but would you happen to know if that was also the original color, and whether this was an early attempt at camouflage? Supposedly, the confederates generally followed the same scheme, (after all, they had mostly former US Army cannons) but there was a lot of variation. Painting gun barrels was probably a bad idea, since they tended to get hot. The Civil War was the first modern war, with weaponry that pretty much made the old idea of two lines facing, a suicidal practice. No one seems to have learned this, but the troops. So I think a lot of generals would have regarded camouflage to be "cheating." It seems to have become a practice in the British wars in India, where British soldiers, realizing that spiffy white uniforms made them wonderful targets, would smear them with mud (apparently the local term for mud was "khaki"). This color doesn't tend toward yellow much if any. For what it's worth, I would call this paint color "forest green" rather than olive drab. I don't know one way or the other, but I tend to think that you are right, especially the commanders slowness to pick up on the idea that having the troops in static lines out in the open made them easy targets for ranging weapons such as rifles and cannon. It seems obvious, especially in retrospect. Now you really have done it! I was already curious about the etymology of "khaki" and now for sure I'll have to look it up. Apparently an Urdu word for "dust." Already looked at that one. The Wikipedia entry also has that and more. Although Wikipedia entries aren't always accepted as references in academic work, the site makes a good place to start looking for more acceptable references, especially in noncontroversial subjects, and, with a bit of luck on your part, can answer informal questions about a subject without further research.